With the tech world still buzzing over Facebook’s $19 billion WhatsApp acquisition, business insurance provider Simply Business has put together a fascinating infographic. 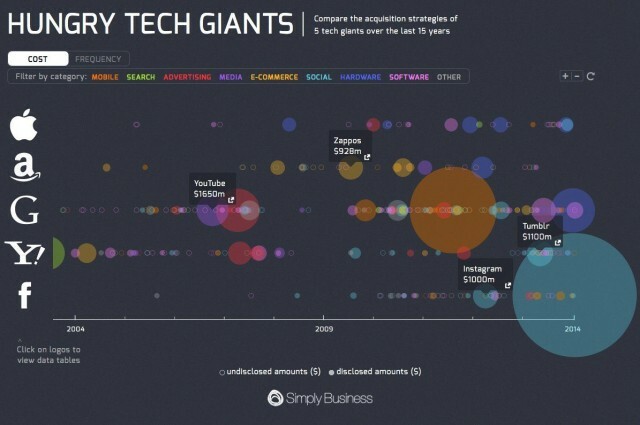 Showing 15 years of acquisitions by Apple, Amazon, Google, Yahoo, and Facebook, the chart lays out in visual terms when tech giants were at their purchasing busiest, as well as how much they typically spend on deals — with the size of individual dots representing the price paid for each startup. The infographic also lets you zoom in on specific time periods, as well as filtering the search by certain types of acquisition. It’s a great way of getting your head around some of the giant numbers thrown around when it comes to tech deals, and also a means of looking at how the product and business strategy focus of major tech companies have changed over the past decade-and-a-half. It shows that Apple has been more or less consistent in keeping the price of its acquisitions low despite its massive cash reserves — preferring to buy companies for their technology and employees rather than just market share. This attitude was imbued in the company by Steve Jobs, who reportedly viewed acquisitions as a “failure to innovate.” While Tim Cook has by and large stuck to this mantra — avoiding massive transformative deals — he has still been proactive about buying companies to bring new intellectual property to Apple. Of the five companies profiled on the infographic, Apple has spent by far the least on its biggest-spend acquisition during the 15 year time period: shelling out $390 million for flash memory company Anobit and $356 million for AuthenTec, both in 2012.